The customised Rolex Submariner worn by Roger Moore as James Bond in 1973’s Live and Let Die is being offered at Christie’s Important Watches sale in Geneva on Nov. 14. Expected to fetch up to about $450,000, it’s the most famous 007 Rolex as it was designed to incorporate several special features by Q Branch. 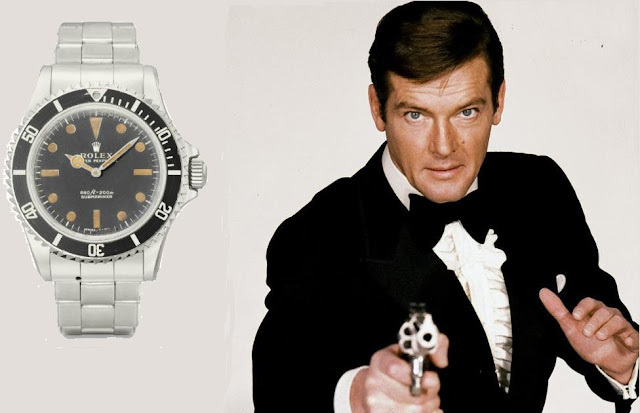 The timepiece’s two most notable tools were the hyper intensified magnetic field powerful enough to deflect the path of a bullet even at a long range – plus unzip a Bond girl’s gown to boot – and a rotating buzz saw bezel, both used by Bond at climatic instants in the movie. The inside case back is signed Roger Moore 007, and it comes complete with two framed black and white prints showing Moore wearing the watch. Designed by the film’s art director Syd Cain, the watch is a modified 1972 model. At the beginning of the movie Bond uses it to unzip Miss Caruso’s (Madeline Smith) dress. When she comments on the delicacy of his touch, he replies, “Sheer magnetism, darling”. While the watch no longer has a movement as it was removed to allow the customisation, it’s sure to draw fierce bidding from collectors. The Rolex still has its original bracelet but it also carries proof that the hyper magnetic field was not real: a pinhole from which a fine thread was connected to Smith’s dress zipper to help the secret agent pull it down.